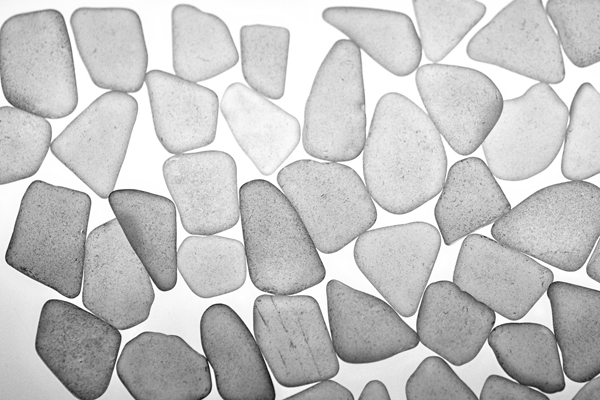 White sea glass is so underrated. It is a powdered sugar doughnut. It is candy, that sticks to your teeth. 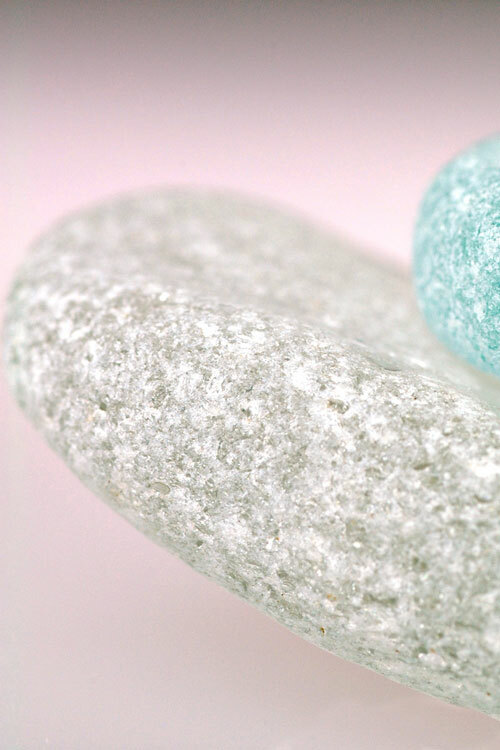 It is the gem that you find in an alchemist’s velvet pouch. It is grandma’s pickle dish, dangling from a chain. 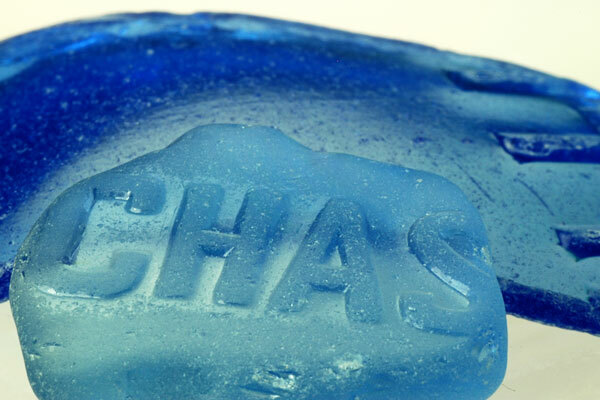 Sea Glass Wisdom: What am I Chasing? 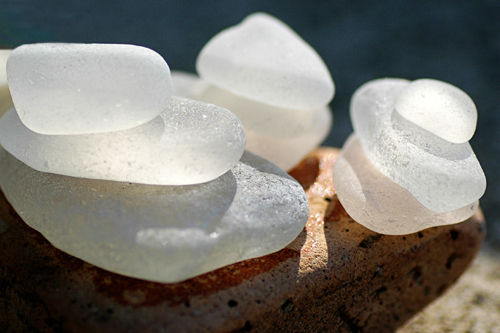 I have a special fondness for sea glass with words. It’s like I’ve found a clue. Or sometimes it’s a message from the Great Beyond. Chase. What am I chasing? I’m chasing something. With fierce determination. Freedom. That’s why there are flames coming out of my heels and my reflection is a blur. I don’t relax. I chase. But the biggest irony of all is that in my quest for freedom, I have given up so much freedom. The freedom to read novels in the evening and paint on Saturdays. The freedom to write poetry late into the night. The freedom to do nothing. 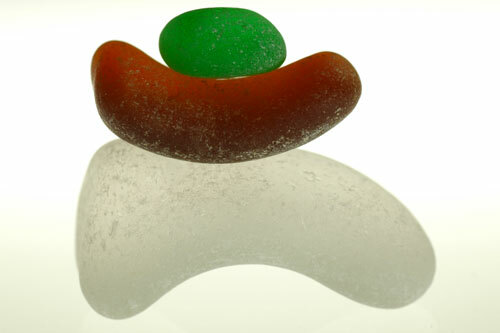 But there is still time for sea glass. 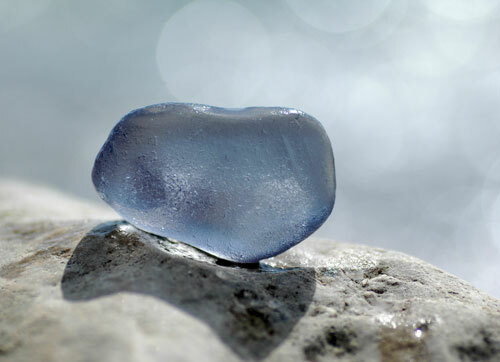 Photo: Cobalt blue sea glass found on north shore of Lake Erie. By Christina Friedrichsen. I poked a hole in my finger and bled whilst practising what appeared to be a simple wire-wrapping technique. Note to self: Do not practise with 20g steel wire. It’s much too stiff and horrendous to work with. I didn’t realize that wire wrapping would be so difficult. Even something as simple as making jump rings takes a lot of practise. After making dozens of jump rings and not having them close properly, I figured out that my cutters just weren’t ‘cutting it.’ Well, they actually were cutting it, but they weren’t creating perfectly straight cuts (I’m using half-hard sterling silver wire, which is quite soft.) I finally ponied up the money for a jeweler’s saw which I have yet to use. Hopefully the cuts will be much cleaner. Meantime, I’ve bought a bunch of sterling silver jump rings on Etsy. I also found out I was closing the jump rings using the wrong technique (I was moving both of my hands.) Here is a helpful video on how to close a jump ring properly, which involves keeping one of your hands stationary. Now, off to the basement to poke some more holes in my fingers. Arghhh! He applied the quote to his own life as a musician. He said he probably could have written better songs if he had more obedience to his craft and not been distracted by the many causes etc. that have required his time and energy. Now, I’m no Bono, but I could relate entirely. I often wonder how much better my writing would be if I devoted myself entirely to it, instead of dabbling in so many other things. I also wonder how far I could have gone as a visual artist if I would have stayed in art school and ran with it. I am not obedient to one thing. Not writing. Not painting. Not photography. Not jewelry making. But I do obey my heart. 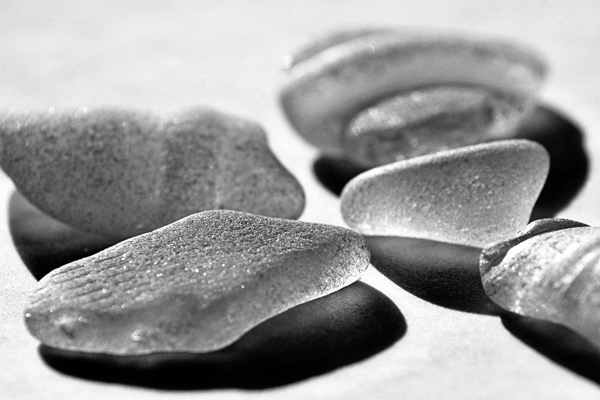 And it tells me that those long, slow walks on the beach in search of sea glass also make life worth living. I always drag my camera equipment to the beach. It’s not just a point and click I carry with me – it’s a big, honking Lowepro backpack carrying my Nikon D70s and two lenses. After a few miles of walking, it feels like a burden. Oftentimes I bring the camera and don’t end up taking any photos. Today I snapped a few during the last few minutes of our trip to the beach. The kids were tired and aching to get back into the car. 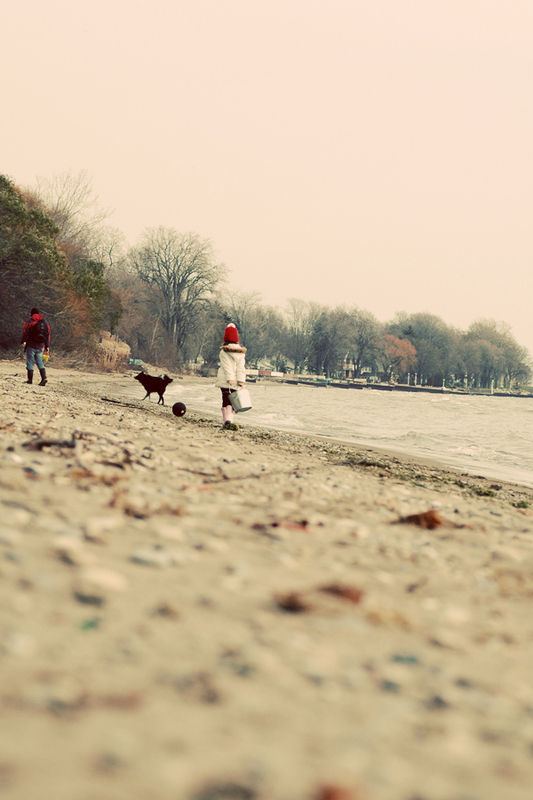 The dog was soggy and sandy. And my legs were tired and not in the mood for doing squats (which is the norm when I take photos. ) 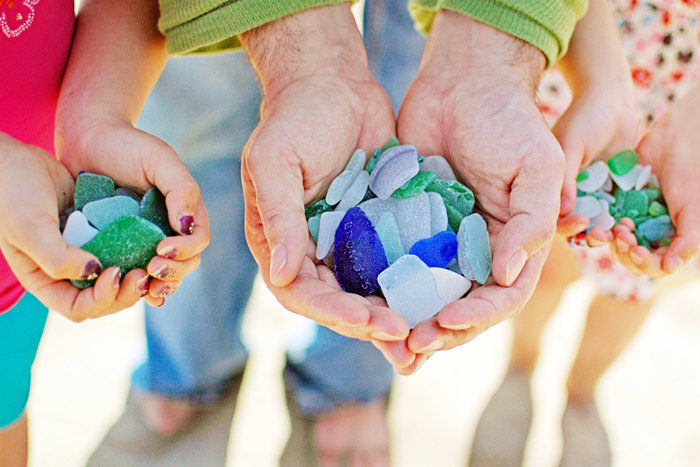 Somehow I rounded up my girls and my husband, filled their hands with sea glass and snapped a few photos. I’m glad I made the effort. 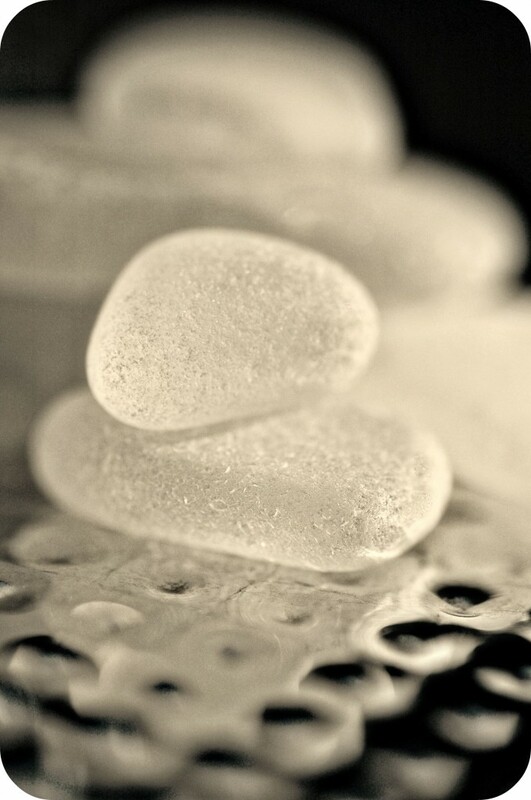 This is one of my favourite sea glass shots. I love how my husband’s hand forms a heart around the glass, and my little girls’ hands form an upside down heart. And I love the colours. I am going to have this one enlarged and framed to remind me of a perfect Easter day at the beach. Darin and I haven’t been out to the beach on our own since last summer. We usually have our two daughters in tow. It was so peaceful and relaxing to go on our own for a change. Before we headed out, we grabbed a large Starbucks coffee and a greasy BELT from Tim Horton’s. The 40 minute ride was pure bliss. No screaming children, no panting dog, just the whirl of the wheels and some ambient tunes in the background. I was suddenly transported back to a time when these carefree road trips were the norm. That was seven years ago. 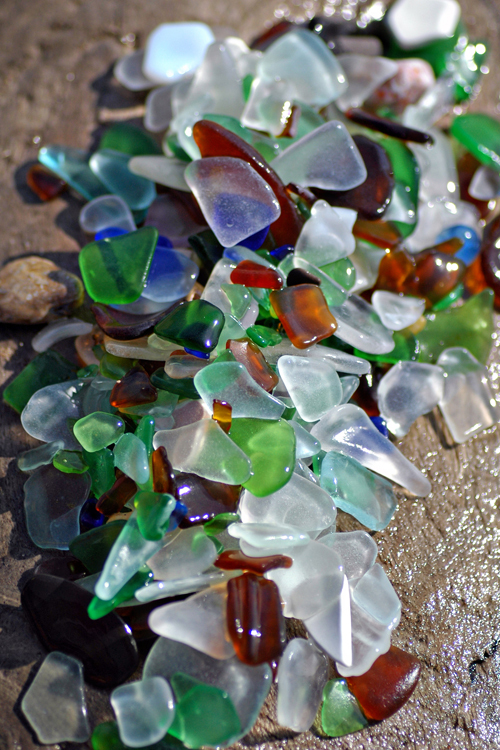 There wasn’t a huge amount of glass today, but we found a few gems. The best one was a huge, smooth and well frosted gray. It will definitely be one of the stars of my collection. It’s much too large to make jewelry with, but it will make a beautiful display piece. I’m quite lucky that I picked it up. It’s so well frosted that it looked like a stone. 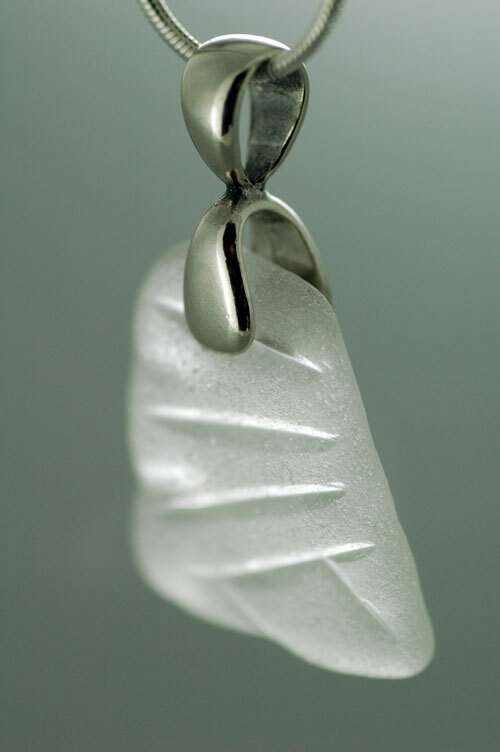 The true beauty and depth of the glass comes through when it’s wet and the sun is gleaming through it. In this form it has a blueish, violet tinge. 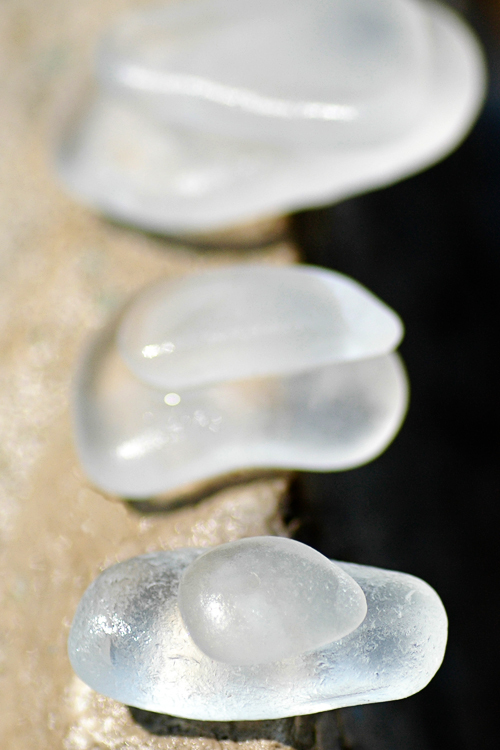 Stunning – as you can see from the photo that I shot today at the beach.